Courtesy of Evan Morrison of the Santa Barbara Channel Swimming Association near Santa Cruz Island, California. 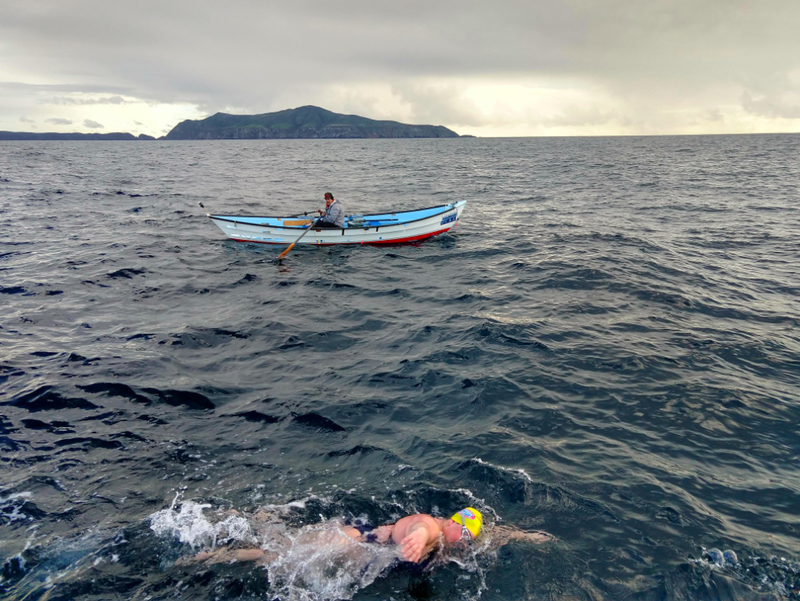 Santa Barbara Channel Swimming Association reported a highly unusual and difficult channel crossing. 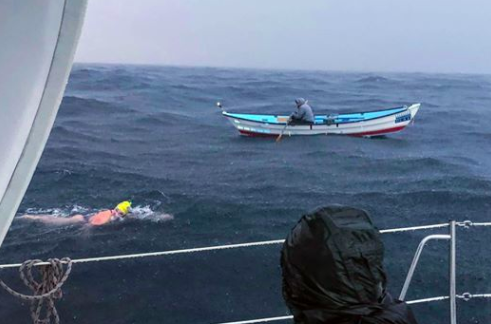 "The 2019 Santa Barbara Channel swim season got off to its earliest start ever with an astonishing [30.5 km] winter crossing by Dr. Caroline Block from Oxnard [on the California mainland] to Santa Cruz Island. Starting from Silverstrand Beach early yesterday morning during a rainstorm and small craft warning, Caroline swam through some of the most challenging sustained conditions we have seen a swimmer endure. The wind laid down briefly in the late afternoon, only to whip up again after sunset. Touching at a perilously dark and surge-y San Pedro Point after 14 hours 56 minutes, Caroline became the first woman (and 2nd overall) to complete a Santa Cruz swim in the island-mainland direction. It was also the earliest-in-year Santa Barbara Channel swim by nearly 4 months [in the organization's history]. Caroline's swim was supported by Captains Dawn Brooks, Alicia Stratton, and Todd Griswold; dory-rower Dave Valenzuela [shown above], crew Robin Rasmussen Rose and Michelle Squyer, and Santa Barbara Channel Swimming Association observers Evan Morrison and Dave Van Mouwerik.